This is the first painting for my systematic theology paper. As you can see, I didn’t paint on my normal watercolor paper. 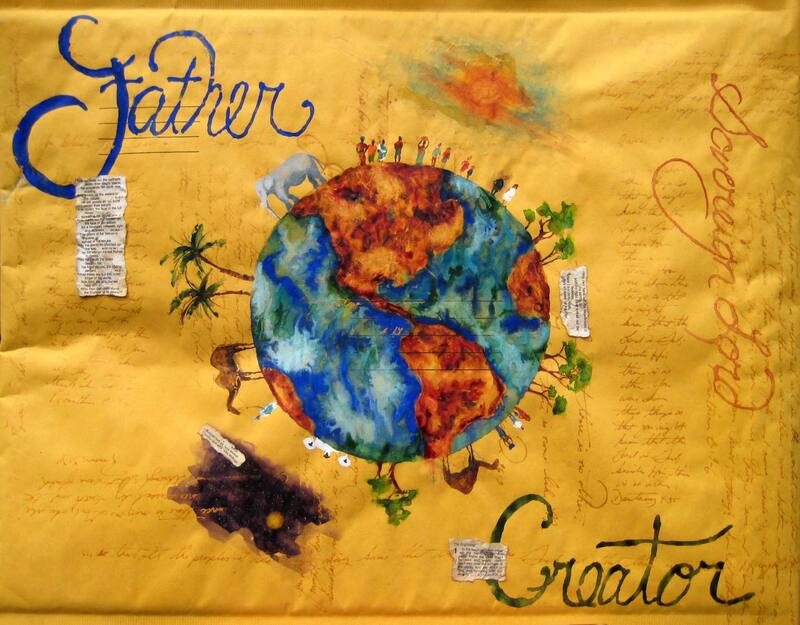 The way I’m symbolizing the 3 in 1 concept of the Trinity (there is one God in 3 Persons) is by painting each separate person (Father, Son, and Spirit) on a different size packing envelope – this is not the most ideal painting surface :). I’ll be placing the Spirit (which will be the smallest envelope) inside the Son (the middle size envelope), and the Son will be placed inside the Father envelope. So I’ll be able to hand-in “one” envelope/painting but there will be 3 envelopes and separate paintings. I’ll explain this a little more as I describe each painting, but even the size and placement of the envelopes represent characteristics about that Person – as you’ll see with the Father. I love that the Lord gave me this idea – it really captures the purpose of this paper. This is my first envelope/painting – the Father. Each painting has scripture on it to describe that Person of the Trinity. The scriptures I have in gold on the backdrop are all about how He is one God and there is no other – I was surprised to find how many there are! Here are the scriptures in gold along with the ones at the top in bold that I placed in the background: Deut. 4:35, Is 45:5-6, Is 46:9, Jn 17:3, I Cor 8:4-6, Romans 3:30. I am also placing names of each Person of the Trinity on their envelopes. For the 1st person of the Trinity I painted: Father, Sovereign Lord, and Creator to capture who the Father is and what He does. The painting of the earth and creation was meant to capture the role of the Father as Creator for He created and He sustains His creation. I also placed torn scripture around on the painting that talk about His work in creation (Genesis 1:1-2, Job 26:7-14, Is 48:13). The Father is the largest and main envelope because the Father is supreme in His position and authority among the Persons in the Trinity. It’s amazing that there is such order in the Godhead – a built in structure of authority and submission. In scripture we clearly see that the Son and Spirit are under the authority of the Father and they gladly submit to the Father – and yet, they are all God. 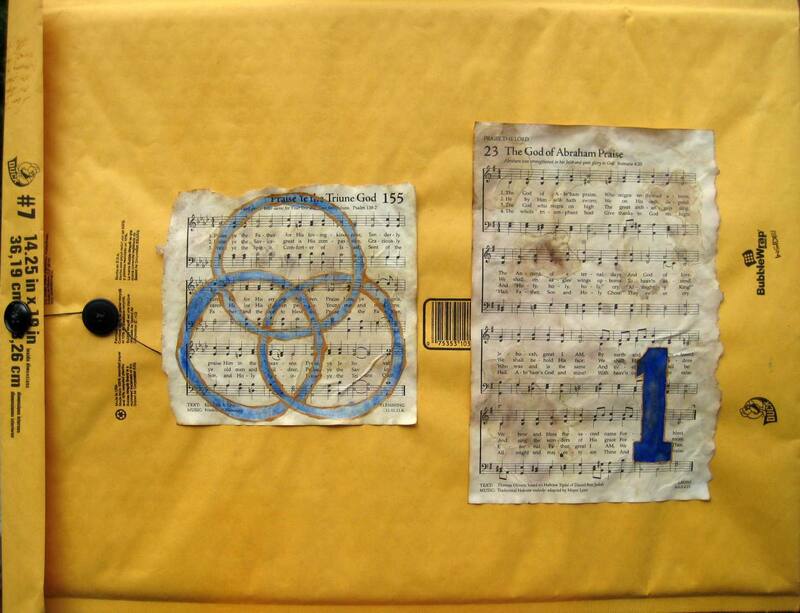 On the back of each envelope I’m putting 2 hymns – one that captures that individual Person of the Godhead and a hymn about the Trinity (I painted the Trinity symbol on this hymn). I hope you learn something new about the Trinity through this or at least are reminded of some sweet truths about our magnificent and mysterious God! HOW COOL Sandi! I love it! God is using you in great ways and Im sooooo thanking Him this morning for the way you bring his love and grace into each of our lives through his gifting in you! Well, Nancy, I’m not sure how to respond to that comment – it blessed and encouraged me is all I can say. I’m working on the Son right now and really needed that encouragement – thank you! oh Sandi, it is really amazing…i love the idea of the envelopes. every aspect is beautiful. i can’t wait to see the Son!! love you sweet friend!! praying for an outpouring of His wonderful inspiring Spirit as you work. Thank you Susan! No credit to me – all the Lord’s idea. Thank you for praying for His inspiring – I need it! Love you too friend – I miss you!!! Your work Sandi is just another reminder that our sweet Savior can and will do and use anything to draw us to Him. I’m personally so drawn to Jesus through your work! Thank you for allowing God to use your gifts, passions, & “sweet spots” to nudge us deeper to know Him. Bless you called one! What an encouragement Nancy! I’m so thankful the Lord is using this work to be more than just a pretty picture. Thank you for taking time to leave me such a sweet comment!